Every year the two major commodity indices (S&P GSCI the DJUBS) are rebalanced based on the sizes of specific commodity markets. This year's changes are smaller than last year's adjustments, which materially impacted the Brent/WTI mix (see discussion). Nevertheless the rebalancing is expected to generate flows in or out of certain commodities by institutional investors and funds that track these indices. The chart below from Credit Suisse shows what the impact of the next rebalancing is expected to be. Once again, the largest move will be a reduction in WTI and an increase in Brent weights. 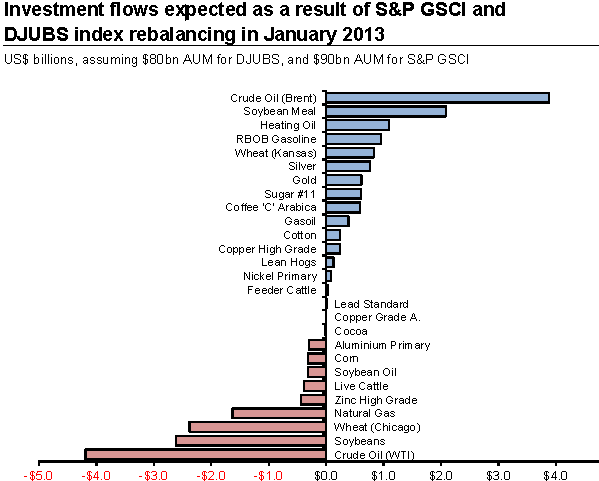 But flows in other commodities are expected as well. The overall impact will be a net inflow into energy commodities, and a net outflow from agricultural commodities and an outflow from base metals.